Vintage doesn’t mean quite what you think it does. Not quite like a wine, where the annual growing conditions (i.e. the rain, the heat) affect the composition of the grape; the evidence for annual variation based on botanical alone in spirits is tenuous at best. But that’s not what the folks at Blackwood Distillery are getting at (solely). In previous years the composition of their gin differed (such as the ’07 featuring mint and elderflower, or the ’08 featuring violet and bog myrtle). Blackwood’s Vintage Dry Gin 2012 features angelica, sea pink (!! ), Marigold, Meadowsweet, among some of the more standard gin botanicals. Sea Pink, perhaps better known as Sea Thrift, is a small perennial grassy bush that features prominent red, pink or white globe flowers. It grows widely, particularly in the UK, in rocky seaside habitats. One intriguing detail is that some sea Sea Pink as a bio-remediative species, as it absorbs heavy metals from the soil. Bees and butterflies are known to be attracted to the bright flowers and its rich nectar. As far as humans are concerned, its the flowerheads that are occasionally consumed, dried out and drank as if a tea. Bright citrus on the nose at first, lemon and sweet orange notes at first, with hints of juniper, and green leaves highlighted with meadowsweet underneath it. Somewhat summery, suggesting trimming flowers in the garden, though alcohol and ethanol notes lie a bit more prominently beneath than might be expected at 40 proof. The palate of Blackwood’s Vintage Dry Gin 2012 is smooth and the entry quite accessible. Sweet orange, meadowsweet, with notes of violet and iris, early, the spirit warms (literally), where the juniper blossoms out of a vanilla/violet custard notes, briefly with some hints of pine, before clean spice blossoms on the finish, with a melange of white pepper and nutmeg notes. The finish is somewhat abbreviated, medium-short in length, ending dry with a pleasant tinge or warmth but nary a flash of heat. Very accessible, and very sippable. Blackwood’s Vintage Dry Gin 2012 mixes quite well also. Nice with just tonic, you get hints of floral, juniper and lemon in your Gin and Tonic. I think that with bolder mixers you see the gin kind of retreating, but not altogether obscured. Perhaps there’s less juniper in that Negroni, but you do still get a distinctive nice gin note. And that’s really how I’d sum it up in the bar. It’s a good mixing gin with a mild, and mainstream palate that lends itself to being tasted but not to being overbearing. While it’s great to recommend in those drinks where you want to taste the gin, but not too much, I think the palate commends itself to gin drinkers to appreciate just on its own. 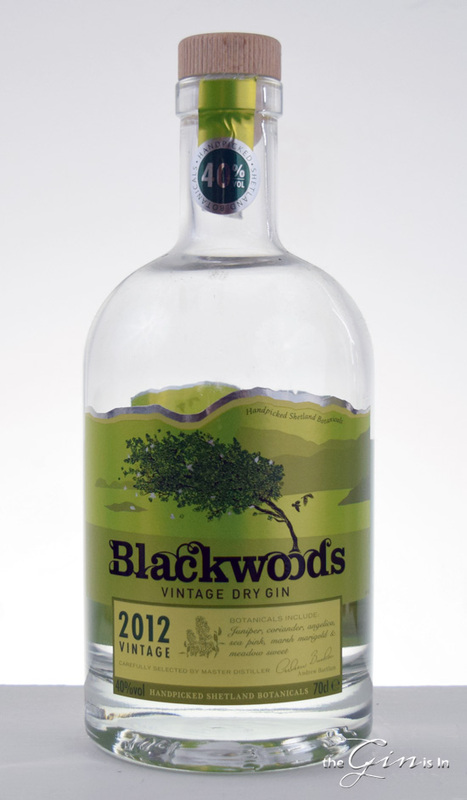 Blackwood’s Vintage Dry Gin 2012 is a good gin with a wide appeal and mainstream potential. Recommended for those looking for something new to mix with at home or in the bar. Blackwood’s Vintage Dry Gin 2012 is an accessible gin that balances the floral, citrus and juniper perspective in a mild mannered way that shows its colors upon closer, careful reflection, but is well-balanced enough to be a good mixing gin. I think there’s plenty to like here, but yet somehow I find myself looking for a bit more than is here. Remarkable issues here. I aam very happy tto see your article. Thanks a lot and I amm looking forward to touch you. Will you kindly drp me a e-mail?